It's getting down to the wire on Costume College preparations. Most of my major projects are a few steps from wearable (gown needs a hem; jacket needs sleeves set), but we costumers know that "wearable" doesn't mean "complete." To complete the outfits, one needs all the appropriate accessories. Since I'm teaching both an "18th Century Undress" and an "18th Century Accessories" class this year, I need to actually have those accessories! While I do have a collection of neckerchiefs, aprons, bows, caps, etc., my focus has been primarily on the 1770s-90s and those items I have won't quite work for the 1740s and 1750s I'm wearing this year. So it's new caps, aprons, and kerchiefs for me. Luckily none of these things is difficult or too time consuming to make. The first of this millinery accomplished is one of the common styles of 1740s cap, the variety that ties under the chin. In my research, it appears that this style of cap was primarily worn at-home, or as undress. The majority of portraits show the cap without additional headgear, but one or two show the cap being worn with a bergere hat, outside. 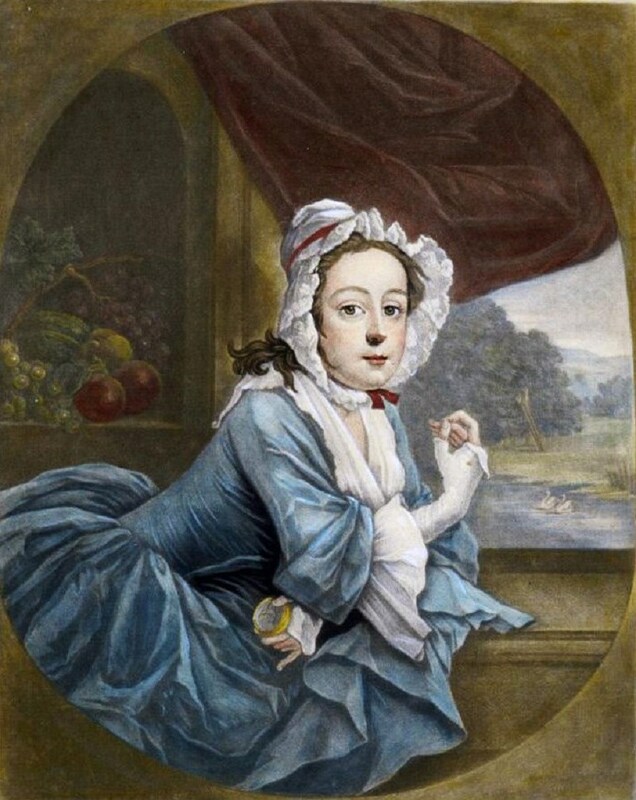 Philippe Mercier (1689 –1760) - Margaret 'Peg' Woffington (1714?–1760), 1740s - worn under a hat here, and the lady with gloves. This would seem she is going out. The Athenaeum - George Rogers and His Wife Margaret and His Sister Margaret Rogers (Francis Hayman - ) English c 1750 - the lady on the right is holding a hat and the middle gal is wearing a hat. The whole scene is one of those weird pastoral family portraits. Still, that the blue lady holds a hat would indicate she might put it on over her mutton chop cap...? 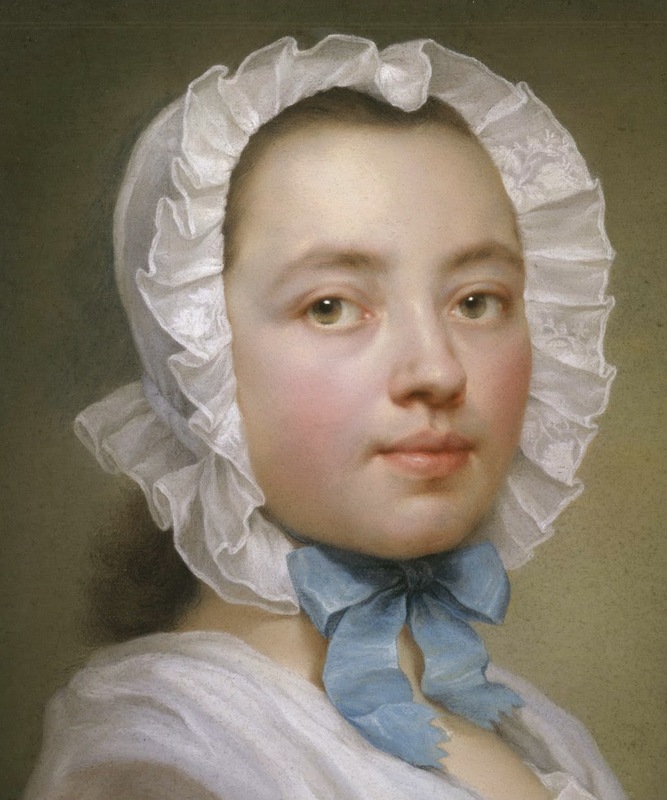 As one Facebook follower put it - this type of cap was the yoga pants of the 1740s. Ladies of all ages and rank wore this cap, some of them finer than others (the ladies and the caps). 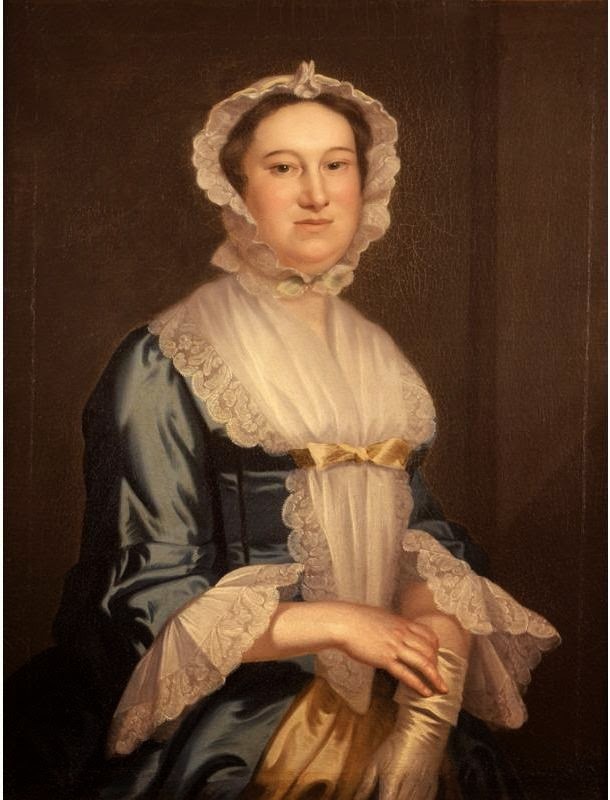 Some were decorated with lace, others with ruffles in the same fabric, which looks to be more opaque than the finer gauze (organza) caps associated with more formal clothing. 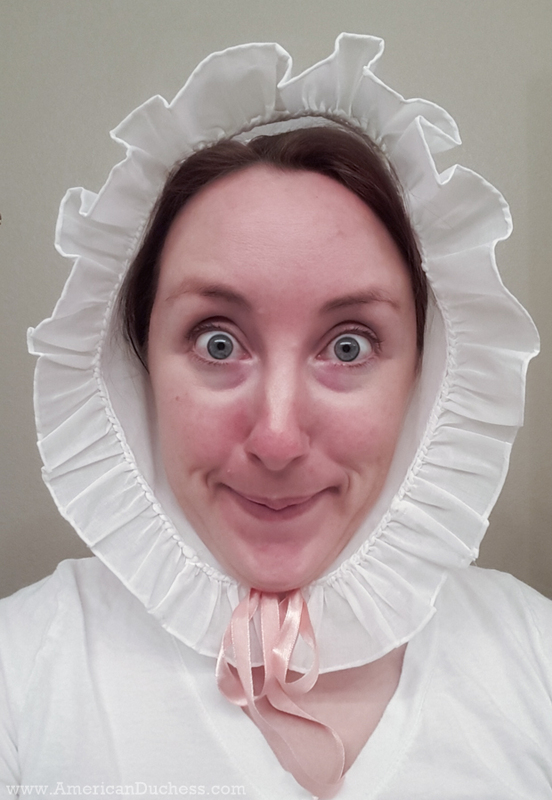 I didn't originally plan to make the mutton chop cap, but I needed some middling class undress headgear for my OL ensemble, and I just couldn't resist the silliness of the style. My cap is made of cotton voile from Dharma Trading Company. I did not wash the voile prior to sewing, so it retained the factory sizing, which gave it a bit of body and made it easier to work with. 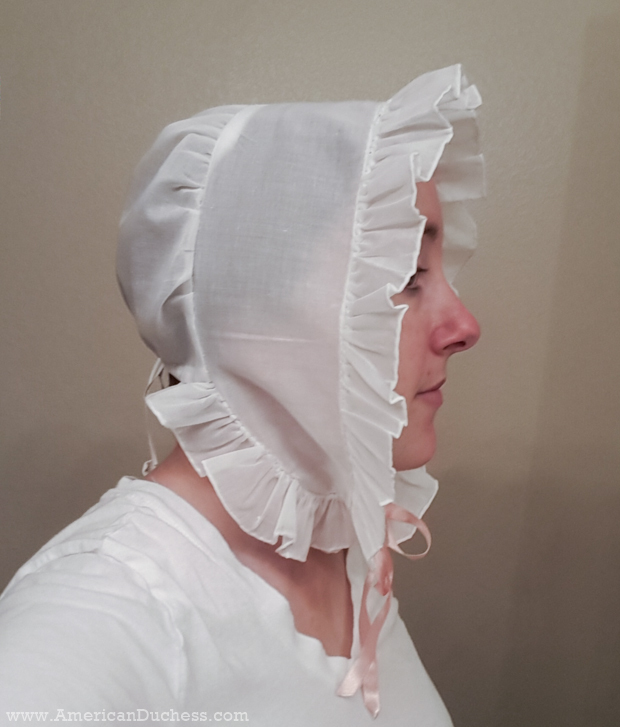 The cap is made in three parts - the crown/caul (puffy part at back), the front piece (draped over the top of the head and down over the ears), and the ruffle. Additional components are the ties at the bottom of the crown/caul, and the ribbon ties under the chin. Now, I fully intended to sew this by machine (gasp! the horror!) 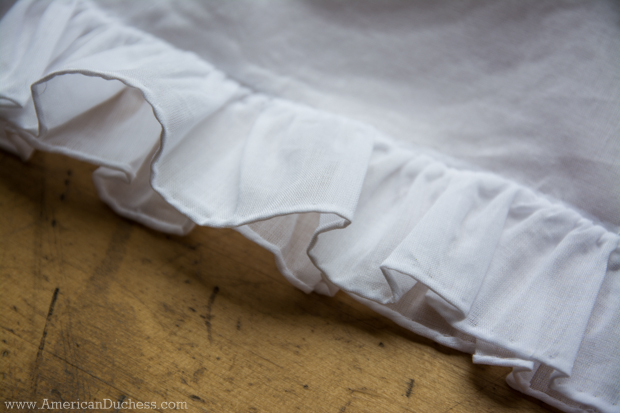 because I'm way short on time, but I wanted to do the roll hem on the ruffle by hand. Abby Cox once told me that the closer something is to the face, the finer it should be, in both fabric and stitching. 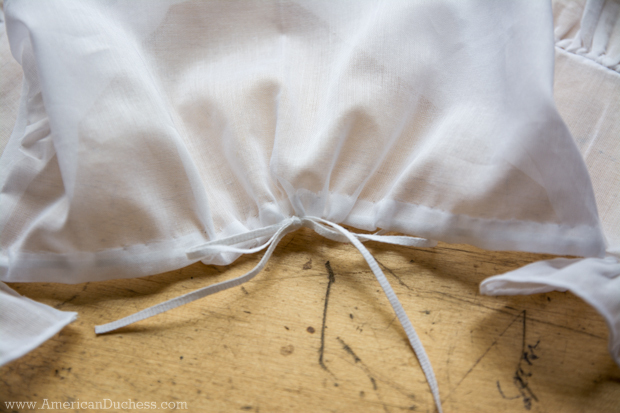 Luckily, cotton voile cut on the straight rolls really nicely, and I used the threads from the voile itself to very finely stitch the rolled hem. Following that, I roll-gathered the opposite edge of the ruffle, but then realize that you can't machine sew a roll gathered edge to the front piece of the cap and have it look anywhere near decent, so I roll-hemmed the edge of the front piece, then whipped the ruffle to it, which looked fabulous. 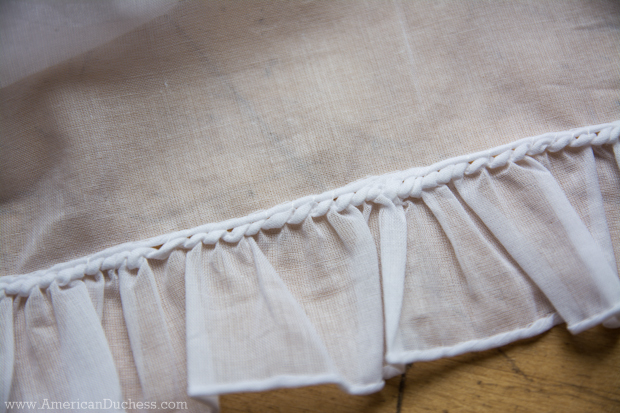 The interior showing the roll-gathered ruffle whipped to the front piece. At that point all that was left was to attach the crown/caul to the back of the front piece, and why bother doing it by machine on that curve, so.... yup, by hand. I made the tiny channel at the base, did a couple quick, small eyelets at the center, then gathered the caul and stitched it to the rest of the cap with a french seam. I'm glad I did it by hand, because it would have been tricky by machine. Then it was done. Whoa! I made the entire thing by hand and it took about 4-5 hours total. Just like so many other things in the 18th century, this was really straightforward to put together, and actually much easier to do by hand than on the machine. And look at this silliness! I'm SO glad I made it! Next time I will refine the shape of the lapetty part to curve and narrow more like the original cap shown above. Okay, this is MARVELOUS. :D I LOVE it!!!!!!! Beautiful job, fabulous style, and it looks perfect on you!! Cute! I love that you love the silliness of this. It makes me think of them in a whole new light. I have one of the early 19th century styles like this to go with my Robe de Madras dress, because it was in the fashion plate, but I have always hated it. I might have to bring it out now and look at it again and try to love it :) Beautiful work, btw! Isn't it funny how sometimes by hand is easier than by machine. Cheers! The hand-stitched ruffle around the face is gorgeous! I think I would cry if I had to wear this all the time, though. In the summer...oy...hot, hot, hot! I like the wind in my hair lol. Haha, well ladies didn't have to wear them ALL the time. This is just one of the styles of caps, and if you hair was dressed then you could have no cap at all, just a hat. Very nice and foofy! 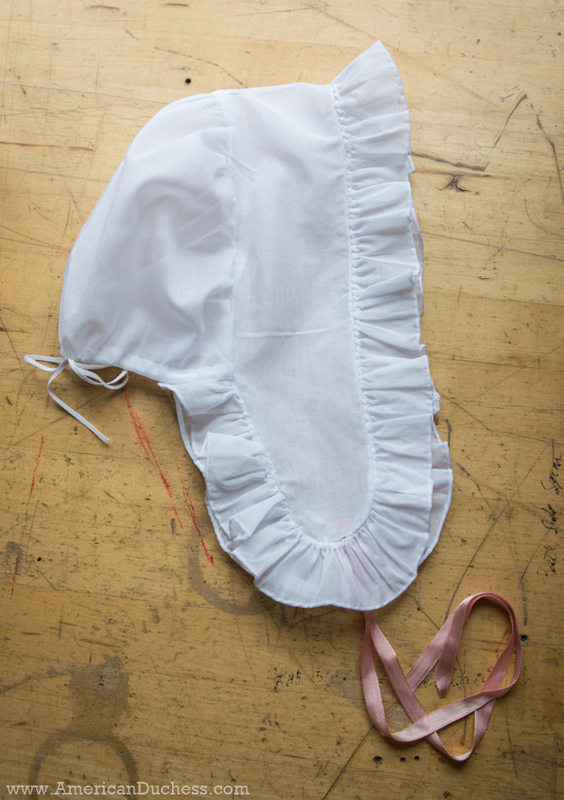 Your rear drawstring looks like a narrow cotton stay tape, one of my favorites for that use. Or is it a handwoven tape? I believe it is a very narrow cotton twill tape. I certainly didn't hand-weave it, lol. This may be one of my favorite posts of yours, EVER. The cap is lovely, and looks just perfect, but the line "Ladies of all ages and rank wore this cap, some of them finer than others (the ladies and the caps)." and that delightful photo of you just-can't-even-ing are such fun. Thought of you last night while looking at the Advanced Style blog - check out the Beatrix Ost link here: http://dianelmajor.blogspot.com/2016/07/sunday-collection.html. Her shoes are Duchess-worthy! You have made such a lovely little cap, is there a pattern for it that you can find on the web? None of the Patterns that I have are anywhere near as pretty.